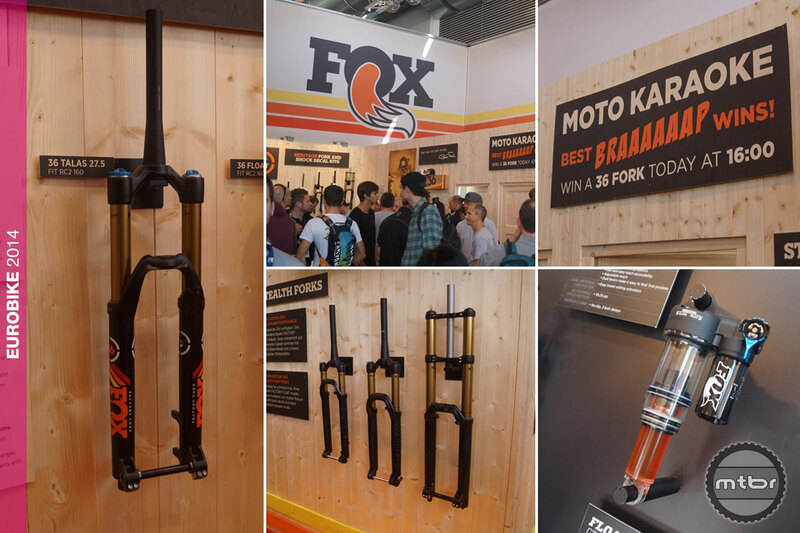 A fork purported to be a FOX 36 TALAS hung from the wall at Eurobike (left), while attendees got their groove on making moto karaoke noises, geeking out on see-thru shock models and checking out FOX’s special edition Stealth forks. If a busy booth and increased OEM spec are any indication (and they are), then FOX is making big gains in Europe. Our casual, unscientific survey shows several brands choosing FOX over European counterparts for suspension, though American rival RockShox appears to be gaining as well. Numbers aside, enthusiasm appeared high in the FOX booth with attendees clamoring over fork cycle testers, transparent shock and fork models, and an opportunity to belt out some Moto Karaoke—an odd but entertaining mash-up of making motorcycle noises and karaoke singing. For us, it was our first live sighting of the elusive new 36 TALAS fork—or at least what we were led to believe was the TALAS. The fork was fixed to the wall and we were unable to cycle it or change its travel. We’ve been loving the FLOAT 36 since its launch earlier this year and have high hopes for its dual-position brethren. Hopefully there’s one in our in-box when we get home. This article is part of Mtbr’s coverage of the 2014 Eurobike trade show in Freidrichschafen, Germany. For more from Eurobike CLICK HERE. Chicago-born Don Palermini became a cycling-based life-form in the sixth grade after completing a family road bike tour of his home state. Three years later he bought his first mountain bike to help mitigate the city's pothole-strewn streets, and began exploring the region's unpaved roads and trails. Those rides sparked a much larger journey which includes all manner of bike racing, commuting, on- and off-road bike advocacy, and a 20-plus-year marketing career in the cycling industry that landed him at his current gig with Santa Cruz bicycles. Now residing in the San Francisco Bay Area, his four favorite words in the English language are "breakfast served all day," together in that order. Fox to open new facility in Asheville, N.C.
Am I missing something? Had one on my bike for almost a month. They have just been in very short supply.